As Franklin Roosevelt tried to rally the nation to support his economic policies, his rallying cry was remember the Forgotten Man. 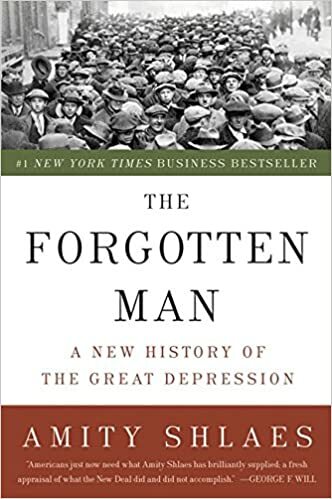 Amity Shlaes history of the Great Depression reminds us who the Forgotten Man really was. He wasn’t the unemployed worker or devastated farmer found on Roosevelt era posters, but came from an essay by a classical liberal professor in the closing decades of the nineteenth century. He was in fact the working man chosen by the political elites to pay for their schemes. In The Forgotten Man Shlaes follows Roosevelt’s “new liberals” from their fascination with communist Russia and Fascist Italy to their patchwork of ill defined policies. Most importantly she does an in depth chronicling of the results of what Roosevelt called the New Deal. Especially timely in today’s economic times, it follows the progressive liberals of FDR’s administration as they try to prove their their incessant belief that government was the answer to everything. Highly Recommended!